Join us at one of our regional Special Access Experiences across the country. Our SAX events are uniquely curated CMO and C-Suite Roundtable discussions, workshops, and immersive experiences. Here you will interact and ideate in a small peer-group setting with access to featured speakers, provocative, problem solving, best practices sharing, and more. Our SAX events are complimentary for eligible CMOs and C-level executives by application below. Cancellations made within seven business days of scheduled events, will incur a $150.00 cancellation fee. Bitcoin, Blockchain and Customer Loyalty: What’s the Point?– Our focus for the evening will be the intersection of customer loyalty and digital currency. While the press focuses on Bitcoin, an entire ecosystem of other platforms and currencies are emerging that have the potential to reshape the nature of customer engagement and remake traditional points-based loyalty programs. Mark Bonchek, is founder of Shift Thinking, columnist for HBR, and faculty member of Singularity University. Mark Bonchek will give us a primer on digital currency, share his views on the potential for branded currency, and host a provocative conversation on loyalty in a digital age. 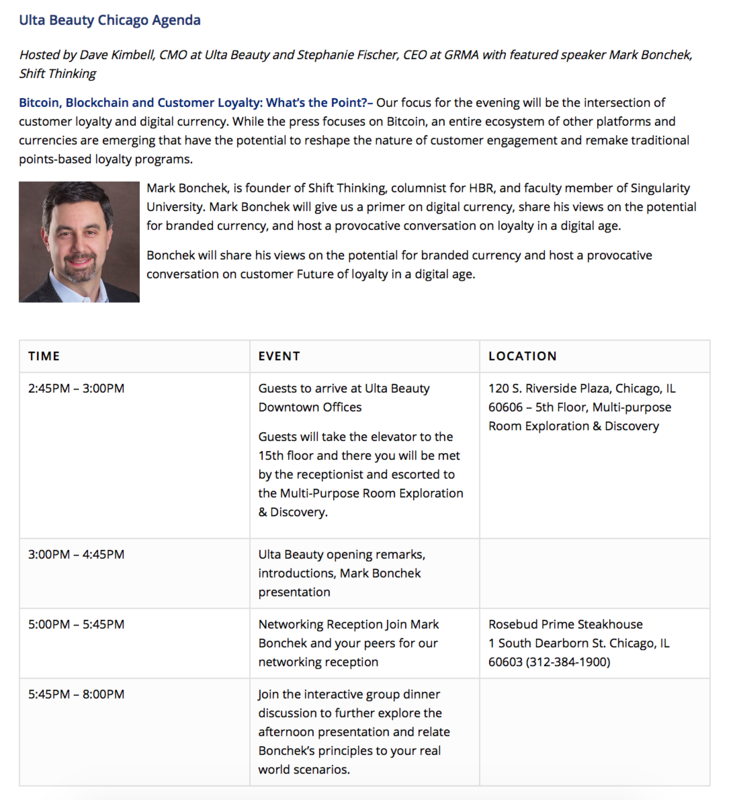 Bonchek will share his views on the potential for branded currency and host a provocative conversation on customer Future of loyalty in a digital age. 2:45PM – 3:00PM Guests Arrive at JCPenney Corporate Offices. Guests will need to provide ID when checking in with security. Guest may check in with the receptionist inside the main entrance lobby and be escorted to the meeting room. If need to make any changes or delays the day of the event, please contact Johnnie Mills at 972-537-7456. 5:45PM – 8:00PM Join the interactive group dinner discussion to further explore the afternoon presentation and relate Bonchek’s principles to your real world scenarios. 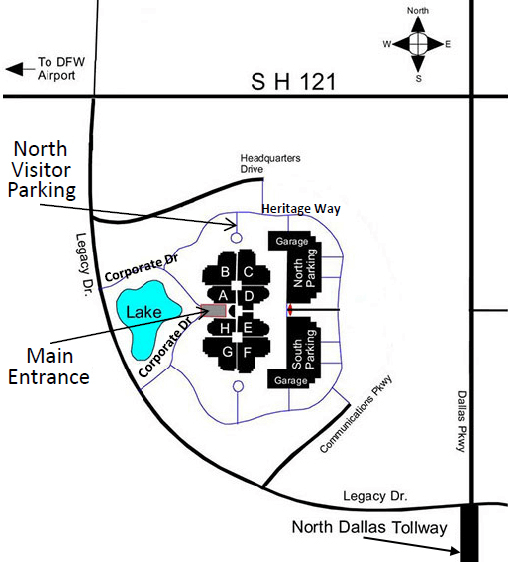 From Hwy 121 (driving east from DFW Airport): Take Hwy 121 to Plano, and take Legacy Drive exit. Turn right on Legacy to the first light. Turn left on Headquarters and followit to the first stop sign. 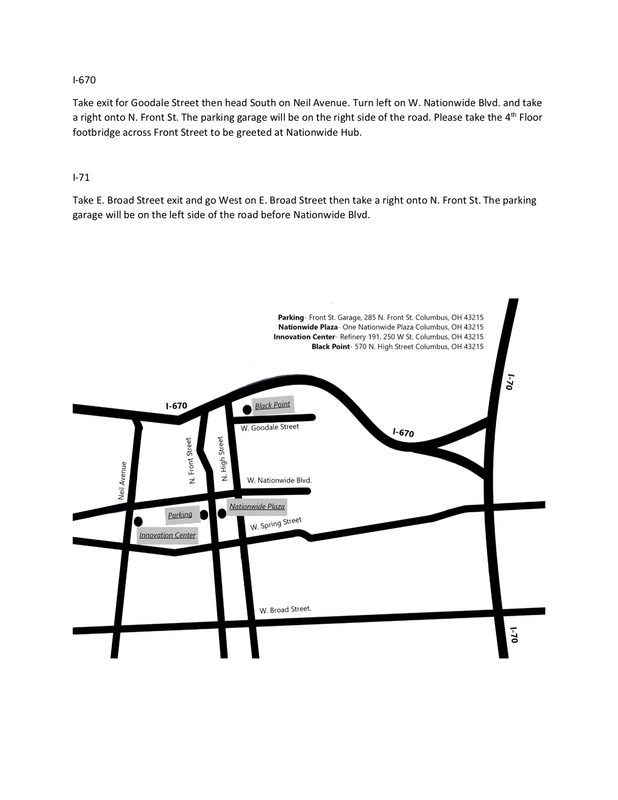 Turn right and then take the 1stleft to the North Visitors Parking Lot. You can enter the North Visitors building at the double doors nearest the parking lot and a JCPenney Security Guard will assist with securing a Visitor’s Badge for you. Proceed down that hall to the North Visitor’s Reception desk and the Receptionist will contact Johnnie Mills to greet you. If you are utilizing a car service: they can drop off at the Main Entrance off of Corporate Drive, proceed to Security desk to secure a security badge for you. Security will contact Johnnie Mills to greet you. Terrance Williams, President, Emerging Businesses Group and EVP, Chief Marketing Officer, Nationwide, and Stephanie Fischer, Chief Executive Officer, GRMA, invite you to GRMA’s Columbus Special-Access Experience: A CMO/C-Suite Roundtable Meeting. Format: This meeting will be an interactive small-group discussion setting. Terrance and Chetan Kandhari will kick off the day with presentations about how changing consumer expectations in a dynamic environment are driving Nationwide’s response to win in the marketplace. 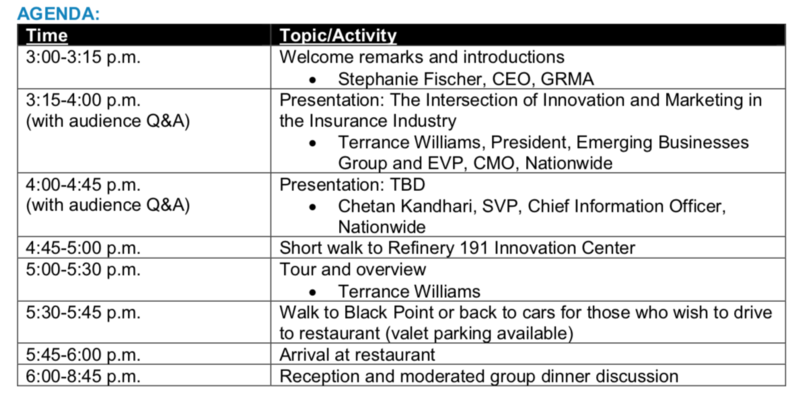 Following these keynotes, we’ll take a tour of Nationwide’s innovation center, Refinery 191. Guests will also enjoy a networking reception and a moderated group discussion to close the evening. Program description: In 2017, Nationwide expanded Terrance’s Chief Marketing Officer role to include overseeing a new organization called the Emerging Businesses Group. The logic is simple, although our businesses models are complex: marketers intimately know our customers and our Emerging Businesses teams are dedicated to solving their needs and friction points in new and unique ways. The insurance industry is made up of trillions of dollars of premium, making it ripe for disruption from non-traditional competitors and startups. Our category must think differently and prepare for a future that is evolving faster than any other time, driven by technology advances and consumer behaviors. Terrance will provide an overview of why and how establishing an Innovation group and Emerging Businesses team focused on the future is one way Nationwide is preparing for what’s next. IT Innovation and market disruption: Following Terrance, Chetan Kandhari, SVP, Chief Information Officer, Personal Lines & Direct IT for Nationwide, will share his thoughts and insights into the current IT environment and how Nationwide IT is driving innovation, and is positioned to disrupt the industry to better serve our members and customers. Terrance Williams serves as Nationwide’s President, Emerging Businesses Group and Executive Vice President, Chief Marketing Officer. In this capacity, he is charged with helping guide Nationwide into a next-generation insurance and financial services organization while maintaining the core strength of the brand. His current responsibilities include driving all aspects of Marketing and helping prepare the company for the future through leadership of the Emerging Businesses Group. Since beginning with the company in 1995, Williams has held a broad array of positions touching almost every segment of Nationwide’s broad portfolio of businesses. His underwriting, claims, sales, operations and various P&L management roles led him on a journey spanning multiple U.S. cities and helping him build a personal brand as an exceptional leader of people and results. Born and raised in the low country of South Carolina, Terrance holds a Bachelor of Science in Insurance at the University of South Carolina and a Master of Business Administration from Walden University. He enjoys traveling, reading and is an avid classic car enthusiast. Chetan Kandhari is the SVP and CIO of Personal Lines & Direct IT at Nationwide. In this role, he is accountable to set the technology strategy to deliver solutions for personal lines insurance, and for the direct and digital strategy for the enterprise. Based in Columbus, he currently is leading our Personal Lines Transformation and Digital programs. At Nationwide, Chetan has progressively held roles of increasing responsibility. In his prior role, Chetan served as SVP and CIO of Enterprise Applications. 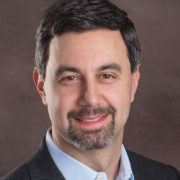 In other roles at Nationwide, he has led the Customer Data and SOA Solution Organization. Earlier in his career, Chetan was a consultant with Diamond Technology Partners and Ernst & Young focusing on large scale program delivery and arch itecture. Chetan was born in India, where he frequently returns to visit, and he moved to the U.S. in 1993. Married, with two children, he enjoys hiking, reading and vacationing with his family in his free time and encourages his associates to look for a balance between work and life.